In today’s article, we tell the story of the queen of drug smuggling. The woman who inspired Pablo Escobar and drove the Medellin Cartel to its bloodthirsty heights. You may have been gripped recently by the Netflix drama on the life of Pablo Escobar, but did you know that long before Escobar there was The Godmother of Cocaine? Also known as The Black Widow, Griselda Blanco has a place in history as the queen of drug trafficking for creating methods for smuggling and murder that are still used today. Griselda Blanco was a blood-thirsty innovator in the world of drugs and death. Read on to find out about the astonishing life of Griselda Blanco. So just who is Griselda Blanco? Said to be responsible for the deaths of around 250 people, including at least two of her three ex-husbands, Griselda Blanco died with a bible covering her chest, in a butchers’ shop. Both charming and murderous, it is no surprise that Griselda’s dramatic story was made into a movie by Lifetime in 2007, entitled ‘Cocaine Godmother: The Griselda Blanco Story’, starring Catherine Zeta-Jones. A shocking tale from beginning to end, Griselda Blanco is said to be the inspiration for the 1983 classic ‘Scarface’. Let’s take a look at the life of the Godmother of Cocaine. The woman who is said to have brought cocaine and murder to the streets of Miami. Part of the infamous Medellin cartel, the sociopath label came early for Griselda when she kidnapped and murdered a boy in 1954, at the age of 11. When the boy’s parents refused to give in to the demands for a ransom payment from Griselda and her friends, Griselda’s friends dared her to shoot the boy in the head. She did. Murder number one, aged just 11. 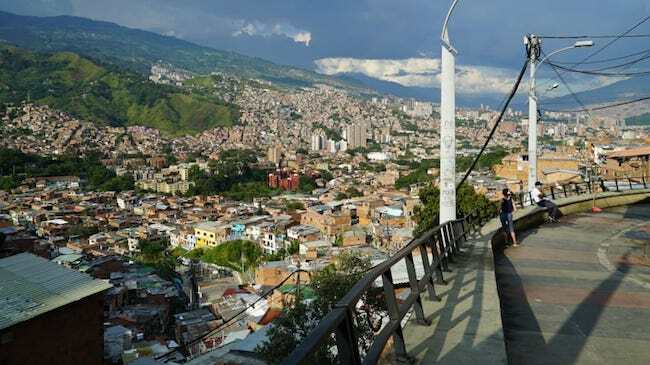 Living in Medellin, a city controlled by the Medellin Cartel, Griselda was involved in crime from a young age. Sexually abused by her mother’s boyfriend, Griselda Blanco ran away from home when she was 14. After falling in love with her first husband at the age of thirteen, they got married and had three children: Dixon, Uber, and Osvaldo. Both involved in criminal activity, they divorced in the sixties. The Godmother is said to have murdered him ten years later over a disagreement about a business matter. In the early seventies, Griselda moved to America with her second husband, Alberto Bravo. Settling in New York, Griselda really found her feet, as she established her lucrative drug smuggling empire. The Godmother’s successful Colombia to New York route, involved innovations such as drugs flown in by light aircraft and ‘drug-smuggling underwear’ with hidden compartments, created in her own lingerie shop, back in Medellin. Alberto Bravo, Blanco’s second husband was said to have come to an end at the hands of the Black Widow, after a shoot-out between Alberto and Griselda. Furious about missing drug money, Alberto and six bodyguards were killed, whilst Griselda came away with a mere wound to the stomach. Clearly, this was not a woman to be messed with. However, things came to a head in 1975, when Blanco left America in a hurry to escape arrest. In doing so, Griselda managed to avoid what would have been the biggest arrest for cocaine smuggling in history. After lying low in Colombia for a few years. Griselda returned to America to continue her profitable drug-smuggling business. However, this time she chose a new location. Miami. Within a few years, Griselda’s manic ways had turned Miami on its head. By the eighties, Miami was out of control. Cocaine trafficking and the savage violence that accompanied it were rife. The blame is placed firmly at the feet of Griselda Blanco’s wild and savage methods of cocaine smuggling. A callousness that placed her at the very top of the Miami drug scene. Her ruthless fight to remain at the helm became known as the ‘Miami Drug War’. She is said to have invented such barbaric acts as ‘the motorbike assassination’. The motorbike assassination is when an assassin shoots a victim from the back of a motorcycle, driven by an accomplice. Griselda and her gang of frenzied smugglers nicknamed the ‘Cocaine Cowboys’ were documented in a 2006 documentary of the same name produced by Alfred Spellman and Billy Corben. During the Miami Drug War, Griselda established herself as the leading drug lord in Miami, amassing millions and millions of dollars in wealth. During her heyday, her gang’s drug smuggling activities were said to be turning over $80,000,000 per month. Brutal and cold-blooded, she was said to have killed innocent bystanders, associates, double-crossers and even a small child. Whilst ruling the waves in Miami, Griselda met her third husband Dario Sepulveda. They had a son together called Michael Corleone (yes, he was named after the film, The Godfather). When Dario tried to leave Griselda and return to Colombia with their son Michael, she is said to have had him shot en-route. Michael Corleone Blanco was returned to Griselda in Miami. Griselda’s violent ways came at a cost and she had many enemies. After yet another assassination attempt she left Miami and went to live in California. Griselda’s cut-throat rule in Miami was eventually diminished after the U.S. government finally intervened, and the drug war in Miami was finally bought under control. 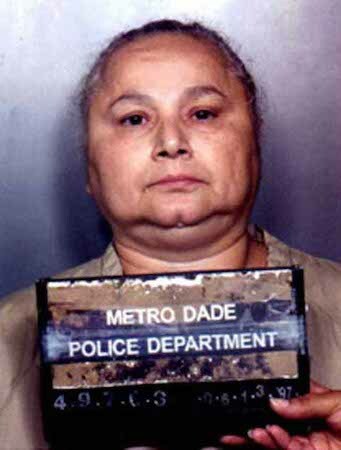 Arrested in her bed whilst reading a bible in February 1985, Griselda Blanco was sentenced to 15 years in prison for distribution of cocaine. When she was turned over to the Miami Justice Department, nine years later, it was to face three murder charges. However, the case fell apart after a key witness was discredited and Blanco took a plea deal. Griselda was sentenced to an extra 10 years behind bars. After serving 19 years behind bars, Griselda was released. Blanco is said to have continued to run her drugs business whilst she was in prison. She is even suspected to have concocted a plot to kidnap John F. Kennedy Jr. in return for her own release, from inside prison. After her release, Blanco was deported back to Medellin, Colombia. Griselda remained in the shadows until her murder in 2012 at the age of 69. Gunned down in her local butcher’s shop whilst buying $150 of meat, she died with a Bible on her chest. The bible was placed there by her daughter-in-law who had been waiting in the car. Blanco outlived all of her three children from her first marriage. Each of the boys ended up in prison in the U.S., then murdered when they were deported back to Colombia. Griselda Blanco’s last son, Michael Corleone Blanco was under house arrest when his mother died, having been arrested four months earlier for cocaine trafficking. Michael maintains that his mother had become a born-again Christian before she died. Griselda had managed to outlive many of her adversaries by the time of her death. She was estimated to have amassed $2 billion dollars in wealth by the time she died in 2012. Griselda is blamed for paving the way for drug smuggling routes to New York, Miami, and England from Colombia. A problem that is still being addressed today. Griselda Blanco – survivor or sociopath? What do you think? Share your comments below. Follow us on social media to see more amazing stories like this every day. Just click the icons in the top right corner of the page.